What: The All-American Quarter Horse Congress is the world’s largest single-breed horse show, with 24,500 entries in 2017. Held at the Ohio Expo Center in Columbus, the show attracts 650,000 people, and generates $382 million in the central Ohio economy. What: Opening night for the Columbus Blue Jackets vs. the Carolina Hurricanes at Nationwide Arena. What: Cheer on the Buckeyes as they face Indiana for homecoming at the Ohio Stadium. Admission: $5 – children 12 and under are free with an adult. What: The Columbus Italian Festival is an annual festival and has something for everyone! You’ll find live entertainment, Italian dancing, and lots of great food. There’s also a great kid’s area and market areas. What: Presented by Coors Light: Andy Grammer performs live at Newport Music Hall. Multi-platinum selling pop artist Andy Grammer is all about inspiring and empowering the world by communicating his truths through his music. The first male pop star in a decade since John Mayer to reach the Top 10 at Adult Pop Radio on his first two singles, Grammer has taken the music world by storm with a succession of anthemic pop hits, 6 of which are certified gold or better. What: Jake Owen just announced his “Life’s Whatcha Make It Tour 2018,” with most shows taking place at baseball stadiums across the country. 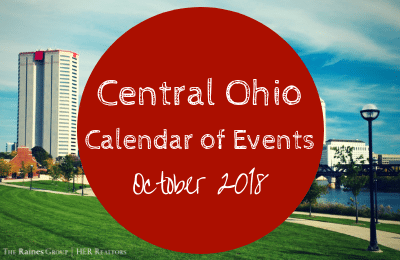 What: For one week in October, local and emerging designers showcase their collections during Fashion Week Columbus, starting with the 9th Annual High Fashion Tea Runway Show and concluding with the Finale Runway Show. The Fashion Week Columbus community is dedicated to empowering creativity and the expression of individuality and confidence through fashion. We strive to provide a strong and supportive community in which new designers can learn and grow their careers. We encourage an atmosphere of experience and inspiration where seasoned designers and buyers can discover new perspectives where ANYTHING is possible. What: The Columbus Marathon was first run in 1980 with 2,500 participants. There is also a Columbus Half Marathon for those who prefer a slightly shorter race. What: HighBall is the nation’s fiercest costume party. Staged in the fashion capital of Columbus, this yearly event for the Halloween season bridges runway style with the culture of the Short North Arts District. Be a part of the HighBall street spectacle and model yourself on High Street. At HighBall, you are what you wear.